Erle Stanley Gardner was not just the creator of PERRY MASON—at the time of his death, he was the best-selling American author of all time, with hundreds of millions of books in print. Among those books were the 29 cases of the brash, irresistible detective team of Bertha Cool and Donald Lam. Last year, Hard Case Crime brought out the first new Cool and Lam novel in decades, THE KNIFE SLIPPED, lost for 77 years after Gardner’s publisher refused it. 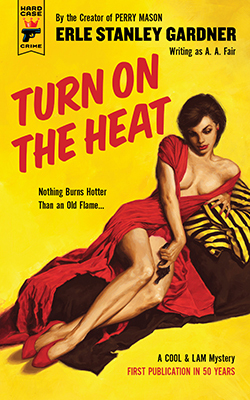 Now, we’re bringing you the book Gardner wrote to replace it, often considered the best in the series: TURN ON THE HEAT. Features a new cover painting by Laurel Blechman, working from reference photos shot by the legendary pulp illustrator Robert Maguire.